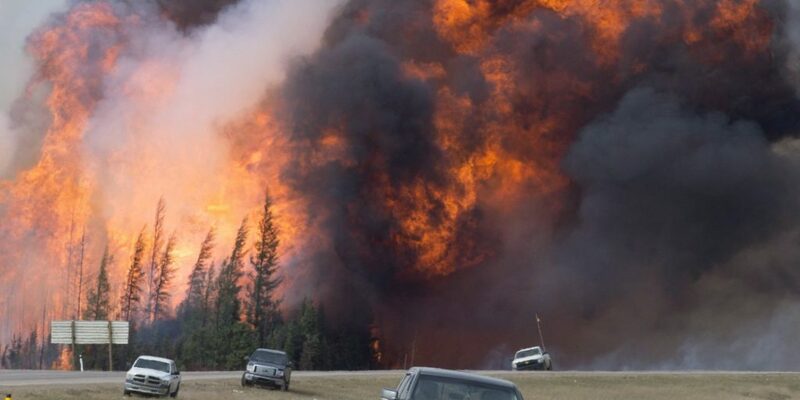 Alberta declared a state of emergency and ordered the evacuation of the more than 88,000 residents of Fort McMurray, a town in the heart of Alberta’s oil country, as a first responders struggle to contain a massive, wind-whipped wildfire. An extremely dry winter coupled with unseasonably hot weather drove the size and intensity of this fire. This is part of a larger trend, as climate change has made Canada’s annual fire season longer and more intense over the past few decades. The fire has resulted in Alberta’s largest ever fire-related evacuation, burning 1,600 homes and more than 210,000 acres, an area larger the city of Chicago. At this point, first responders have indicated that the fire has become so dire that the only hope for getting it under control is a change in the weather. Temperatures in Alberta were up to 40°F above average last week–caused by an atmospheric blocking pattern, the sort of weather phenomenon that played a part in the California drought, and is linked to the melting Arctic ice. Snowpack was also 60 to 85 percent below normal. Northern Canada is warming at twice the rate of the global average. In Canada, wildfire season now starts a month earlier than it used to and the average annual area burned has doubled since 1970, according to Mike Flannigan, a wildfire researcher at the University of Alberta. Alberta has already had 330 wildfires this year, more than double the recent annual average. Increasing temperatures cause large-scale die-off of trees and undergrowth, providing more fuel for the fires. This is amplified by milder winters, which allow beetles and other insects that kill trees to survive instead of freezing.